Bigger, Badder and Better than EVER! New locations. New moves and vehicles. Great Graphics. She's back! Action heroine Lara Croft returns in this impressive action adventure game from Eidos. Once again, the world's most famous "grrrl gamer" must jump, swim, climb, and shoot her way through numerous challenges. There are five locations and 15 massive levels to explore, including the South Pacific, India, London, Antarctica, and Area 51. Unlike previous games in the series, this version lets you visit any of the gaming areas in any order that you prefer. This change enables beginning players to immediately appreciate the diverse gaming environments and designs of different levels that have captivated advanced gamers for the duration of the popular series. Tomb Raider: 3 !! GREAT GAME!! This is a great game to own I have and I beaten It ten times and I sill play it the level's are pretty to look at the background's are ok it's colorful and a little rich here and there. Speed Dash, Monkey swing, kayak and quad bike help Lara out of tricky situations. In the game fine the ancient meteor rumored to have life giving power's. HEY! get ready for anything. PS. save your heath pack you are going to need them. I must agree with many of the other reviewers in that this is by far THE worst game in the Tomb Raider series. I beat this game a long time ago, but I have been bored lately so I dug it up and started to play again. My opinion has not changed since I labored through it the first time. I would never have even finished it the first time except that I thought it MIGHT get better (or even slightly fun) as the game went on. Nope. Now, don't get me wrong. I am a huge fan of the whole Tomb Raider extravaganza; it's an excellent and clever collection. But I was disappointed so much in this one that it almost killed my interest to continue on with the later games in the series. First of all, the levels are unstimulating and repetitive. I hated the levels in India and the South Pacific Islands so much that I purposely killed myself off a few times just to get the frustration out. As a general rule, I think just one nature-based level should be allowed for Lara; they both were so damn similar and I got tired of killing lizards and monkeys. Then, for someone who loves a good puzzle, the puzzles in this were just ridiculous. I had to buy the strategy guide just to find my way around the confusing dead-ends (and 'dead' I mean literally). And by the way, the strategy guide was misleading and seemed like it didn't even go with the right level at times. Also, some of the stunts and moves that Lara has to make to reach intricate points in the game are so precise that you have to save your game before even ATTEMPTING them...or say hello to some huge backtracking or unsightly death. But oh wait...you can't save your game anytime you want. You must have the beloved save crystals! Too bad I'm always reluctant to use them in fear that I might need them for something more important than jumping to a tree limb. I gave this game two stars for two reasons. The first being that Lara has some new moves---crawling, monkey-swinging sprinting, etc---and those were quite nifty at times (unless I was about ready to gnaw my own hands off from everything else). The second reason would have to be that I liked some of her unusual foes---the creepy Shivas, in particular. Excessively difficult even with guide book! Lara Croft games have NEVER been any good. I remember when the very first one came out 10 years ago. Teens were practically DROOLING on their controller every time they saw Lara's pretty face. Tomb Raider must have been advertised like it was the most groundbreaking video game to ever hit the freakin' market. The thing is, the games are boring and Lara Croft isn't very pretty. If polygon-breasted girls are your thing, go for it. But they aren't MY thing, and I know I'm not the only one to think so. Lara Croft isn't good-looking to the millions of internet gamers who understand that a blocky-looking computer babe isn't going to automatically make a game any fun to play. I'll give Lara Croft SOME credit. She was one of the originators of the "running around half-naked female shooter/adventure" type of video games. In fact, you might even say she was a MAJOR influence because soon after her very first adventure, more and more game companies were making the main characters in their games half-naked chicks. Lara brought something new to the world of video games and I will give her credit for that. It also doesn't help that the puzzles you have to solve are ALWAYS really awful (and appear frequently) and, because of the jumping problem, very frustrating to complete. Trying to aim your gun at an emeny isn't exactly a walk in the park, either. The whole series has been an overrated disaster up to this point. By the time Tomb Raider 3 was released people were REALLY getting fed up with the series. Now, these same people will tell you this was because they kept releasing more and more Tomb Raider games, but I actually think people got sick of Tomb Raider because games like Resident Evil and Silent Hill came along with a similar style and improved on it *drastically*, making Tomb Raider look awfully dated by comparison. At least the third Tomb Raider game has SOME decent-looking background levels. I guess the company who created Lara Croft finally understood that Lara's pretty face ALONE isn't going to get the job done anymore. I mean, at least in some places the backgrounds LOOK good . Not exactly the prettiest environments available on the Playstation of course, and most of the time all you see is darkness or candlelight. But what's THERE is okay to look at, at least. Tomb Raider 3 features a challenge that is mostly only challenging because of the above-mentioned jumping problem. She simply doesn't jump the way you want her to. You'd THINK the game company would've dealt with this problem with all the new moves for Lara they added to the game, but no, none of these new moves make the game any easier. The artifact-finding storyline had potential but unfortunately the frustrating challenge ruined it. Awesome! the greatest TR game! Good edition to the Lara Croft series, but with a few bugs. If you loved Tomb Raider I & II then definitely get this game. Tomb Raider III has the same feel and gameplay as the first to so fans will not be disappointed. The new graphics are great! The new textures are more realistic and such touches as sunbeams and her smoking guns really appeal. On the downside, items are smaller and much harder to spot and identify. Lara's new moves are fun to try out but the crawling feature is a little hard to control at first. As for the new save option, all I can say is get a hint book right away. The weapons cheat will also give you 50 extra save crystals. Trust me, you'll need them. As for the analog compatabilty, I'm not sure it's worth it. Most of the time it's great and makes the game real fluid, but sometimes when you're backed up into corners or trying to look through windows the screen starts jumping wildly. Also I haven't experienced much vibration at all. I don't think the guys at Eidos really planned for analog the way the creators of Metal Gear Solid did. The worst one in the whole series. The third in the hugely enjoyable instalments of Lara Croft's adventures, cyber-babe Lara continues to collect artifacts whilst casually eradicating the world's rare animals (including the last T-rex). This time Lara begins her adventures in a temple of Kali in India, after a piece of an ancient meteorite with strange powers. The storyline is weaker than in the first two movies owing to the new feature of a non-linear plotline. After India, Lara can choose to explore the south sea islands, London, or Area -51 before finally venturing to Antarctica. Whilst the storyline is flimsy the new weaponry is the best to appear in the games. Along with the usual weapons Lara now can have a Desert Eagle pistol with great stopping power or the Heckler and Koch MP5 favoured by special forces. Her new skills this time round include crawling and a very useful sprint function that means you don't have to bounce around like a fool to cover ground quickly. The graphics are sumptuous, the animated Kali statues look fantastic. New ways to die include immersion in cold water and shoals of vicious piranha that can kill in seconds. I adore the TR games & I have completed them all except for this one. I have tried to get into it and have started it on 3 separate occasions. I just do not find it fun. The most frustrating aspect is the save crystals. This game is unreasonably hard in some sections yet you are afraid to save and waste a save crystal in case you need it more later on. I don't feel the crystals add to the challenge of the game. They just make the game annoying. The game is way too hard and there are too many puzzles. For a few reasons new people of the Tomb Raider games should not start out on this one, unless they are really skilled at video games. Seriously I beat Tomb Raider One and Two and even Four with a heck of a lot more ease than I did with part Three. So no I would not recommend this to new gamers but people that want a challenge this is the game to get. One of the biggest reasons this game is so hard are the secrets. They sometimes put the secrets in places you would never even notice. So I advise, if you want the secret level at the end of this game, to get a strategy guide cause 99% of the time you cannot find all the secrets on your own. The secret level though is not neccessary to beat the game at the end, and not truly worth the bother to me. I was so happy and exhausted to just finally beat the game that I could have cared less about a secret level and wouldn't have wanted to play it anyway. And that was another problem. How hard the ultimate boss at the end was. I thought the dragon in part two was difficult- at least when it hit me I didn't automatically lose. With the ultimate boss in part three if you get too close he will spew this stuff at you and right away you drop dead. It was difficult and frustrating and took me forever to beat. Yet I cannot say it is impossible, for I did at last beat it, but it is NEARLY impossible and will take you most likely a long while like I. What I did was the best, I got out my rocket launcher and just kept blowing away at him while jumping around and around that platform. I definitely would not stand there or get too close make sure you are as far away as possible for he will not spew that stuff at you unless you are close. Then I guess the next hardest part of part three was just the levels themselves. 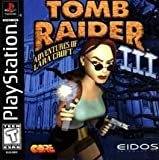 Some parts of the game were very difficult and without the strategy guide next to me I would have encountered many, many dead ends or stepped into a place that just ended Lara. It grew pretty frustrating at times and the worst part of it all is that you cannot save anytime you like- so unless you cheat and get a load of crystals you will do some backtracking. Nevada- In this part all the medi packs you saved up, all the ammo you saved up before- the guards take it all away from you so you have to go through the levels finding your guns and picking up as many medi packs as you can. It grew to be very difficult and I hated that part of the game. The only good part of this level was at the very end when you got to see a few alien bodies. South America- For its lovely scenes and it wasn't impossible to beat. I also liked the dinosaurs they put in, it reminded me of Tomb Raider One all over again. And London- London was fun as well I enjoyed playing there, with what looked like the same Sphinx- like statue placed in this part as was in Tomb Raider One, except this time you don't go into this one. India- Sometimes a challenge that got on my nerves but then the rest of the time it was just normal Tomb Raider stuff, a little boring of a level compared to the others. The statues coming alive were pretty scary though. Anartica- Creepy part of the game. At the ending part of all Tomb Raider games there is some breed of creatures you have to fight- in part one it was what looked like animals turned inside out- in part two she fought what looked like action figures- and now in part three she has to fight mutants. Creepy definitely. Got a little scary sometimes. And this part of the game was not too hard, but indeed I was always kept on alert with those mutants. One problem I hated in this part though was the carts- those mine carts drove me crazy I was always dying in them. Just keep working at it though, eventually you get around those corners without dying. Overall I give this game a 3.5 to a 4 star rating. It is definitely not as good as the first two, just a heck of a lot more frustrating but indeed it was a challenge and Lara Croft is still a fun character to play with so I can't hate this game, but I definitely will not play it again for a long time. It is just too stressful and hard of a game to play all the time. Even check out a cool feature where Lara can practice moves in her own estate! Tomb Raider 3 is unargueably the best Tomb Raider yet, keep an eye out for the newest Tomb Raider "Tomb Raider: Angel Of Darkness" for Playstation2 and PC. The best playstation game ever. Not the best to begin the series with. This is my fav Tomb Raider game (the 1st is a close 2nd), but.... It's way too hard for people just starting with the series. You really have to check out all of your options, because secrets are often irretrievable once you passed a certain point (The level River Ganges even has 2 alternative routes, one of which makes you miss out on a secret!) and in other points you really start to think the makers of this game are a sadistic bunch hellbent on annoying the hell out of you. Some, in retrospect fairly easy, moves kept me occupied for hours. But, all in all, a game isn't a game if it isn't challenging. And this game is challenging to the max! Frustraiting, but stick with it! I loved both TR1 and 2, so for Christmas I got TR3. I new it was going to be a bad one from the start, but I kept playing. Sometimes I wanted to throw the controller across the room because the controls on the game aren't that good, but because of the good atmosphere and backround, I would walk around in areas just looking at the scenery. I stuck with it. After getting past India I got to choose where I wanted to go. I stuck with it. The beautiful islands and underwater creatures that swam with you, and the dinosaurs that chased you were so awsome. I stuck with it. London was well done and the cathedrals were too cool! I stuck with it. Nevada was well done with the dry scenery, and the cool UFO and whole alien vibe was scary. I stuck with it. Getting to Antartica finally came, and I loved it there! You travel around in snow (DUH!) and the whole TITANIC boat thing was cool too. Eidos has done it again. 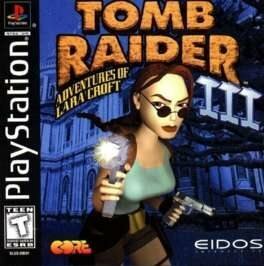 "this game is the best of the three"
Tomb Raider 3 was by far the most difficult Tomb Raider I have ever played. I'll admit, I used every cheat in the book in order to beat the game. But can you really blame me? The game first starts off with an incredibly difficult jungle level, in which you have the option of finding a few secrets and then beginning the level, but regardless, you'll be jumping to a slope and then jumping over a set of spikes, and then (surprise!) jumping over another set of spikes, and finally landing at the bottom with a save crystal and a bunch of different directions to go. Don't go into the sinking sand and watch out for anything that looks dangerous because chances are, it'll be the last dangerous think you look at. Finally, after a period of a week to a year, you've finally beat the jungle levels... WITHOUT CHEATS! Well I bet you were quite tempted! Now choose your destination. The strategy guides all tell you to go to the Nevada Desert, and then to the South Pacific, and then London. If you watch the entire "Story So far..." feature, you'll notice that the game plays the scenes with South Pacific first and Nevada Desert last. So nobody cares what order you do it in, it doesn't matter much. And believe me; you WILL get frustrated either way, so go to the one you want to go to first because it will take you FOREVER to finish that section of levels. Finally, after God-knows-how-long, you finished the whole globe, and get this; you did it ALL WITHOUT CHEAT CODES! I congratulate you. NOW WE GET TO GO TO ANTARTICA!!! Antarctica is incredibly difficult, and it ends with a big, mumbo-jumbo mother-of-all-spiders human-headed thing. Oh, and one shot with the rocket launcher just won't kill it! And one thing to keep on mind, one-hit K.O. As in, if it hits you once, it will kill you. Good luck! But in spite of all of that, I really enjoyed seeing Lara in new costumes and playing in her new house. It was a lot of fun to get the racetrack key and find the shortcut at the racetrack. I must say, I really did enjoy Tomb Raider 3. My credibility as a die-hard TR fan may be shot with this one review; but I'll take some thumbs down for being honest. TR3 is not the best of the bunch as the company asserts - rather it's the worst game in the entire series. I base this on the fact that I've played every TR game thus far and it's the one I like the least. What makes me so upset is the fact that this game could have been great. After the first two installments, I was excited and bought the third one - as I'd played the series from the start. I was convinced it would be just as great as the other two. Was I ever wrong. Let's talk about the good before the bad, as there's not much positive to say. First, the mansion is much improved. We have a quad bike track, a longer obstacle course, and new moves (climbing, sprinting) to deal with. Plus, there are some little puzzles, such as gaining the key to the track, that add a nice touch. The animation has improved once again and seems more fluid. And the controls for Lara are smooth. They work well. 1) Story: the story itself is really just a mis-mash of TR1 and TR2 put together. It's highly predictable due to this. Basically, Lara has to find 4 artifacts for a researcher, that make up a meteorite. This gives the possession vast power. Eventually the researcher turns test subjects into mutants and wants the power for himself. Lara has to stop him of course. It sounds like the developers just put together a loose story from the previous games because they didn't care enough to think up something new. Plus many of the villains Lara encounters throughout the game aren't interesting in the slightest. They have a pasted on quality about them that doesn't seem real. Maybe this is because of the non-linear aspect of the countries you can visit; but they should have at least tried to make them somewhat dimensional, even if a little. Graphics in the levels are another matter entirely. While the animations are more fluid, the graphics aren't. The Jungles of India and the South Pacific's Mudubu Gorge look exactly alike, adding to the irritation. Nevada looks slightly different; but still resembles London in terms of design. Antartica is a welcome change; but it comes too late in the game to be of interest. It honestly gives me a headache seeing the same graphics everywhere for most of the game. Plus any graphics that resemble rocks (Nevada, South Pacific Islands, etc.) tend to blend together. Often, you have trouble spotting what is or isn't a ledge to jump to. The bottom line is: the developers should have done a better job. Unfortunately, it's clear that they didn't care while making this game. It's just a money-grab for them from the fanbase. And that's something I don't appreciate. 3) The Puzzles: Here's a major problem. The puzzles are absolutely impossible in this game. Some of them are extremely hard. Now, I don't mind a challenge with tough puzzles (think previous TRs or a Myst game for reference). But, the developers have managed to turn a fun challenge into the opposite - something that continually irritates you. Gone are the days of the previous TRs where you enjoyed the puzzles. This time the puzzles are frustrating and you wonder whether you should even bother continuing. Solutions will either be way out of left-field or something that you would never guess. Combine this with samey graphics and annoying level design and you have a recipe for disaster. And yes, I used a strategy guide for this game. Guess what? The guide didn't help much either. When an official guide can't help you through the game, you know it's bad news. Of course, I eventually beat TR3; but the only way to stay sane was to tag-team through the levels. I would play a certain number of them until I reached my breaking point. When I could take no more of the game, my dad took over until he too became frustrated with it. (He also is a big fan of TR1 and TR2) At which point I would play another few levels until the cycle of boredom repeated again. Suffice to say, it's not just me who has these issues with TR3. He was complaining about the same things I was. 4) Deaths - Lara will die so many times in this game that it will irritate you. Even if you're a veteran player, you'll find yourself dying like every few minutes in the game. Okay, that may be an exaggeration; but there are some areas where if you make a slight mis-step, Lara will fall to her screaming death. There are also areas where you have to jump on a specific angle or you'll die. In many of these cases, the jumps occur on a jutting out, triangle portion of land. The problem with this is, if you make Lara walk to closer to the edge, you will move with the curve and end up on an angle away from where you want to jump to. So, you re-adjust Lara right? Well, if you run and jump too late, Lara may curve away from the ledge you want to get to. Even simple jumps have their problems - sometimes I found myself dying a few seconds away from where I had last saved. Many of these deaths were not related to my TR skills either. I began to wonder if the game was designed to kill Lara on a constant basis. At least when I died in TR2, I understood why. In TR3, you die for the silliest reasons. 5) Saving: Save Crystals are back and you have to collect them in order to save. Problem? When you're dying left, right, and center at every turn, you're not going to have enough save crystals to get through a level. Plus you don't want to waste them on just trying to make that jump from ledge X to ledge Y. Honestly, even though I hate saying this, I'd suggest using a cheat code for extra save crystals. It's better than having to suffer from a lack of saves because you used most of them in order to make several small jumps from one area to another without dying. 6) Other issues: You cannot see items that you pick up. This may be trivial; but you have to keep navigating to your inventory to see whether the item is important or not, which isn't fun. Also, Lara can get poisoned by animals. While this is an interesting addition, there is one major problem with it. That is: if Lara gets poisoned by a snake, then kills it, you have to use a medipack. But, there seems to be some sort of glitch (at least in my game) where one medipack doesn't work. Lara's health will go back to normal; but will still flash yellow. So I have to use a second medipack unnecessarily. It just adds to the already long list of bad things about this game. In 1996, the brilliant TOMB RAIDER was released. Although the graphics weren't great, the gameplay was. The puzzles were difficult but intriguing and fun, the pace was fast, the amount of action kept things going and there wasn't one bad level. The next year, TOMB RAIDER II was introduced to the world, and God, it was good! It improved upon the original, with each level longer and more action-packed. Even the first level was a treat! Then in 1998, there was TOMB RAIDER III, and it really fails to reach the height of the first two games. Although everybody likes a challenge, this game is just far too difficult. I've only got as far as Level 2, so I had to use cheats, and I couldn't complete any of the other levels. It's still a good, fun little game, but it's very disappointing. This time, Lara Croft must find different artifacts dotted around the globes. All of the artifacts are connected to a meteorite that struck the Earth long ago. Once again, the graphics aren't perfect, although not entirely bad, but it doesn't matter anyway. To conclude, the first two games were fantastic - so enjoyable - but TOMB RAIDER III can be very boring in parts, and it's just too difficult for alot of people. It's not really the best way to start the series if your new to TOMB RAIDER. I own a playstation but i hardly think it's that great a console. Blame it on the N64 for their exceptional games- but i do believe that the Playstation may have some hope left in it. Well Tomb Raider 3 is a good example. This is a huge game with a lot of 3D explosions and gunfire and lots of jumping. Also if you have something against people and animals, then you won't be dissappointed either. You also get to blow uo raptors and a T-rex by the way. Despite being a solid title, i beta the game long ago and have since went on to other 'pursuits' like Zelda. I'm not gonna compare the two, mind you, but let's say that while TL3 is a really good game and somewhat long- it's not gonna make a classic or give Mario or Sonic a run for their money. Simply put, all the TR games are long and filled with adventure. Lara's cute and i like this game but it's just not gonna be what i'm looking for long-term. It's also tedious to have to play through it again. I think it's a mood-game; you're likely to bore through the WHOLE thing when you're in the mood, and that sounds extreme. But as you can tell 4 stars is saying alot cause this game definetely restores my faith in the playstation and it's over-rated games. If Lara were to make the jump to the Dolphin- i wouldn't be surprised; Tomb Raider always had the potential to be a great game; it's just that sometimes- you need a lot of patience and perhaps, this will fit nicely. Finally, the graphics and the sound are passable. Levels are detailed but heavily pixelated and sound sounds cranky or too soft at times.